Kiruna is situated north of the Arctic Circle, and is Sweden’s northernmost city. Growing out of a booming iron ore market in the early 1900s, Kiruna still today depends heavily on the mining industry. Nevertheless, the extraction of iron ore is literally undermining the city, as the ground has the potential to sink slightly. 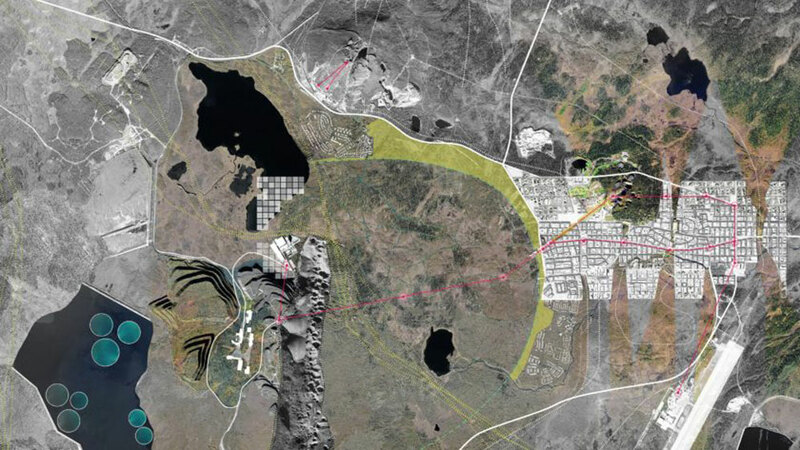 To address this problem, Kiruna municipality together with the mining company LKAB decided to move the town in 2004. LKAB is investing around 1.4 billion EUR (over 15 billion SEK) to relocate the city. 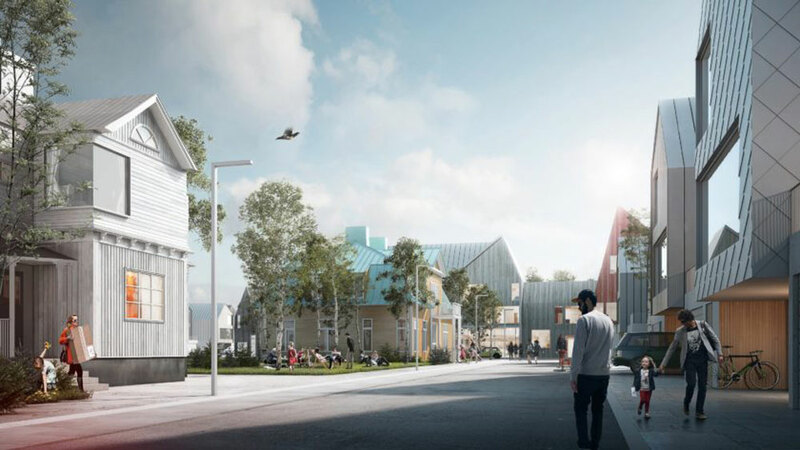 Relocating Kiruna’s most important landmarks, building private homes, and creating the new city centre three kilometres east of its current location was a challenge that the planners and architects addressed through a careful consultation process with Kiruna’s inhabitants. Planning a large-scale move of this nature requires more than building new streets and houses, and should also take into account the city’s identity. Acknowledging this, the planners and architects worked closely with anthropologists to capture the essence of Kiruna. Preserving and/or reimagining the town’s identity. 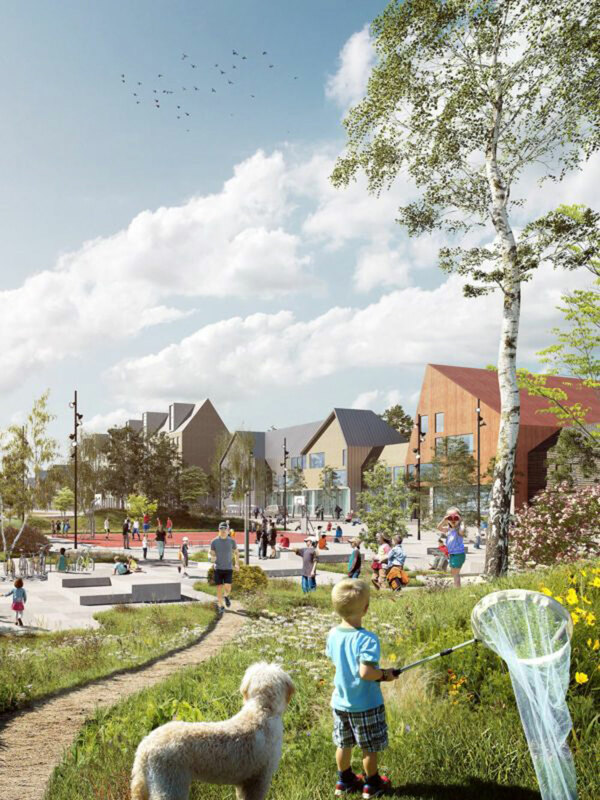 The new urban design invites nature into the city through ‘green fingers’ that stretches from the landscapes surrounding Kiruna, into the town centre. This configuration gives people access to green areas within a maximum distance of three blocks, whilst enhancing ecosystem services. The compact town centre with meeting places is planned to serve as an arena for different opportunities and for connecting people. The plan also seeks to diversify the local economy, currently based almost entirely on mining, by offering opportunities for women and young people. For example, the masterplan acknowledges the potential of the city for tourism, and invites visitors to pass through the town centre, and its shops businesses, before travelling further or even entering nature directly on skis or a dog sledge. Furthermore, 21 buildings with cultural value for the population will be entirely relocated and integrated in the new urban fabric. This is one of the strategies to preserve the identity of the town. In 2018, the ground work for the streets in the town centre along with the infrastructure (water, sewage and electricity) was already in place and a small park for handling storm water had also been built. The clock tower has been moved and the new town hall will be completed in August. By 2033 the move is expected to be complete. Although it is still too early to evaluate the social, economic and environmental outcomes of this intervention, the participation of the local people in the planning process has been noteworthy. The strong power of the local level in the Swedish planning system has been a key enabler, creating a unique and dynamic process between a big mining company and the small community of Kiruna. Although the situation in Kiruna may at first appear strikingly unique, the threat of climate change means that other communities are likely to find themselves in equally untenable locations in the immediate future. Thus, the case of Kiruna offers valuable lessons about how to deal with both the practical and emotional elements of this challenge. Working in partnership with communities to ensure that the identity of a place is retained, along with the bricks and mortar, has the potential to soften the devastating effects of leaving the place one has lived their whole life.